In the previous three parts of this presentation Bill A. Williams, jr.'s "Master Index" and an extract of its "non-biblical" words were examined. In Part 2: (Textual Parallels) the non- biblical words which are relatively unique to Spalding and the Book of Mormon were listed, along with their immediate contextual phraseology. Identification of further parallels in phraseology is determined by locating a certain shared word in both Spalding's work and in the Mormon text, and then examining the surrounding vocabulary for more instances of word-sharing. After instances of exactly the same vocabulary and phraseology (or very similar, related words) have been located in both works, these occurrences can be underlined or highlighted in color to mark their locations in the two texts. 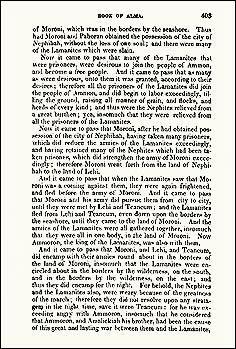 The first graphic (above) shows page 403 of the 1830 Book of Mormon. Bill Williams' extract of relatively unique words indicates that the words "burthen" and "encircled" are found on this page, and that "regulations" is found a page and a half further into the same chapter. The fact that three of the relatively unique words can be found clustered together in such a short textual block indicates the probability that pages 403-405 of the Book of Mormonwill contain more Spalding parallels. Consulting Mr. Williams' word-lists, printed concordances, and searchable e-texts for the two works enables the researcher to quickly locate any other commonalities between this section of the Alma text and Spalding's story. An example of the results of such a search and page mark-up is shown in thegraphic to the left. Here the same page 403 has been marked with underlining and various colors to show its word similarities with Spalding. This mark-up wasdone electronically in an html editor, but the same results could be obtained manually by using pens and the 1830 Alma text in hard-copy. 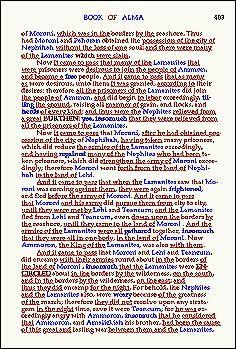 The marked-up text can now serve as an visual demonstration of the vocabulary and phraseology parallels this part of the Book of Mormon shares with Spalding. As can be seen, even in this much reduced picture, page 403 of Alma shares a considerable amount of identical vocabulary (brown text) and phraseology (underlined brown text) with the Oberlin Ms.Not all of the Book of Mormon text is so densely packed with Spaldingish words and phrases as is page 403 of Alma, but those parts where the relatively unique words occur with unusually high frequency also generally demonstrate similar patterns of parallels.Also, where Spaldingish words occur with this degree of density, thematic parallels with the Oberlin Ms. story can be found in abundance. The original html mark-ups created for this comparasion of the 1830 Alma (Chapter XXIX) and the Oberlin Spalding Manuscript are available for closer examination. The Alma Sample has been completed.. An accompanying Spalding Sample (from Ms. Chapter XIV) is still being updated at the Spalding Studies Home Page, as the researcher (Dale R. Broadhurst) is uncovering more parallels between its contents and the Book of Mormon text.